If the thought of eyes full of tears while you cut onions is keeping you from cooking in your kitchen, there are numerous possible solutions. Chopping onions without tears is really simple; you would not have to use any special equipment or treat the onions in a special manner before they are cut. 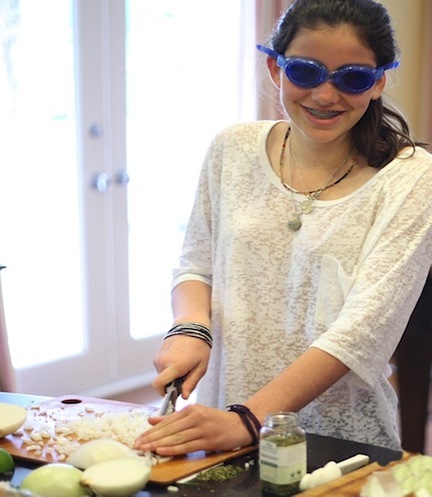 To prevent release of enzymes that cause tears, use a sharp knife for cutting onions. A sharp knife would cut through instead of crushing or breaking the onion cells and as a result, very little or no enzymes at all would be released. Another possible way of chopping onions without tears is to place them in a deep freezer for about 10 to 15 minutes before chopping. This will enormously reduce the enzymes that are released into the air when onions are cut. Consider wear gas tight goggles or a pair of contact lenses. Both create a shield which prevents gas from entering your eyes and creating tears when onions are cut. Half fill a plastic bowl with water and cut the onions beneath the water surface. The enzymes released would be absorbed by the water and no tears would be produced. The same effect can be achieved by chopping the onions near running water or a cloud of steam such as that produced from a kettle in which water is boiling. Consider putting vinegar onto the board on which you plan to chop the onions. Acid found in the vinegar would denature the enzymes produced when onions are cut and thus you will not end up in tears. Bypassing the olfactory nerves is another way of chopping onions without tears. This can be accomplished by breathing through your mouth instead of the nose while cutting onions. Consider placing a lit candle nearing the chopping board. The gas released when you cut an onion would be drawn into the candle’s flame which means it would not enter your eyes. While cutting the onions, keep its tubes pointed away from your eyes. This way, the enzymes released would not enter your eyes.